The Department of Housing and Urban Development this week released a new resource for homeowners facing foreclosure. While it doesn’t specifically mention reverse mortgages, the guide — titled “Homeowner’s Guide to Success” — offers pointed advice that still applies to holders of Home Equity Conversion Mortgages. For instance, the document advises struggling homeowners to contact their mortgage servicers if they find themselves falling behind on payments. HUD also emphasizes the importance of reaching out to housing counselors, pointing out that counselors can help borrowers in trouble figure out their options, work with servicers, and develop a plan to avoid foreclosure and keep their overall finances in order. Connecting troubled HECM borrowers with resources to help them has been an area of focus for lenders this past year, with groups such as California’s HOPE NOW organizing events meant to provide struggling seniors with lenders, originators, and counselors for advice. Back in September, Finance of America Reverse vice president Scott Norman discussed his company’s interest in supporting HOPE NOW with RMD, pointing out that in many households, only one spouse knows the details of the couple’s finances — and if that spouse dies, the remaining resident may not know about tax and insurance obligations that could put the HECM at risk. HUD secretary Ben Carson echoed those sentiments in a statement announcing the release of the department’s new resource. Department officials also warned about the potential for scams to arise in the wake of recent natural disasters, such as the hurricanes that battered the Southeastern United States and Puerto Rico, along with the California wildfires. 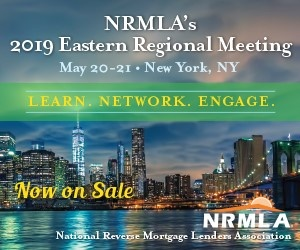 “Steering consumers away from fraudulent schemes is especially important when they are already facing the difficult situation of not being able to make their mortgage payment,” Sarah Gerecke, deputy assistant secretary for the Office of Housing Counseling at HUD, said in the statement. Check out the full resource — developed in conjunction with the Consumer Protection Financial Bureau, the Department of Veterans Affairs, and multiple other government agencies — on HUD’s website.